CrossFit recognizes 10 general physical skills, and goes further to say that you are as fit as you are competent in each of these 10 skills! Each of us come from a different athletic background with the result that each of us has our strong points and our weak points. An ultra-runner may walk into our box off the charts of the cardiovascular/respiratory endurance skill but not be able to squat half their body weight thus showing an impacted level in the Strength skill. A power-lifter may not be able run a mile without stopping showing the other end of the spectrum. We’re here to correct those deficiencies. We train it all, aiming to improve all the physical skills, while specializing in none of them. Our goal is to produce well-rounded athletes ready to handle anything… and handle it DAMN WELL! What type of athlete are you? Whats your strong points, what are your weak points? Here’s the list of the 10 general physical skills in case you haven’t heard. 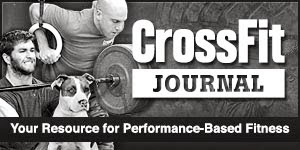 The above list was hoisted from an issue of the CrossFit Journal.